Homemade Gluten Free Chili is a simple and delicious dish that is sure to be a family favorite! There is nothing like a nice warm bowl of chili. A little bit of heat, brimming with beef, beans and that deep chili flavor. Add a handful of shredded cheese, a bit of avocado, and some cilantro. It is pure heaven. Great for company, to take to a pot luck, or perhaps bring a pot to a family that has just moved or had a baby. It is great the day you make it, plus the leftovers are so versatile. Chili Dogs, Chili con Queso, Chili Nachos, Chili Quesadillas…and the list can go on. Homemade gluten free chili is a great meal to keep in your monthly meal planning rotation. Sure, you can by pre-made chili seasoning mix at the grocery store. There are quite a few gluten-free varieties on the market, but why do that when it is so easy to make? There is a good chance you already have the spices on hand! It doesn’t take a lot of ingredients to make this homemade gluten free chili and it is so much tastier, plus it avoids all of the extra additives and preservatives. Personally, I love serving chili to a crowd. It is one of those dishes that you can throw together quickly and just let it simmer on the stove. I have never met anyone who does not like chili! Another awesome thing about this chili is that, just like my Arroz con Pollo, it freezes really well. I like to double the recipe and then freeze the leftovers to have on hand for quick lunches. If you are looking for a vegan chili, definitely check out Mindful Mom’s Black Bean Sweet Potato Chili! Looking for Vegetarian and Paleo? Try this Vegetarian Paleo Chili from Perry’s Plate. What are you waiting for? Grab a pot and you’ll have dinner ready in no time! Add spices, tomato sauce, and water. Bring to a boil and simmer for one hour. Drain beans and add to chili. If it looks to dry, add additional water, a half cup at a time. Be sure to verify that all ingredients are gluten-free. A perfect dish for Autumn/Winter. A variation is to make it with turkey mince. We made a big batch of chili this weekend. Yours looks divine! I love chilli and yours looks good! Thanks for sharing! I love chili, but haven’t made it in ages. It’s perfect for this time of year. Saving to try soon! 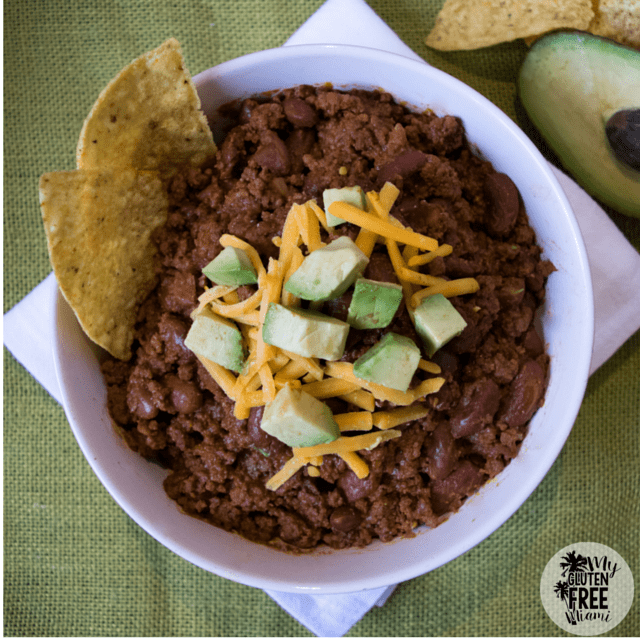 Chili is probably my favorite fall food, ever and this one looks wonderful! I just wish it wasn’t still 95 degrees here in Phoenix! I agree, there’s nothing like a warm bowl of chili! Can’t wait for the weather to really cool here in LA to make a huge pot of it. Yum! I’m always looking for a new chili recipe– it’s getting cold and damp out!!! Great for a cold day! I love chili!! I want to top some french fries with this! I make vegetarian chilli a lot and we call it rajma. But I Have been thinking about adding minced turkey in my chillies. Your version looks good. Wow, this is my dream come true! I will definitely be trying this in the winter months. Looks meaty and chunky! Just how I like my chili’s! I like beans in chili too, always use them. I shouldn’t have read this with an empty stomach! The chili sounds delicious, and perfect for the rainy weather we’re having today. I grew up on Chili! I can’t wait to make your recipe for my family. I love chili but never made it before! I must change that and make this, yum! It is so simple and such a crowd pleaser! It is great with corn chips or corn bread. This recipe looks so simple and hearty, can’t wait to try it! Nothing like chili to warm you up, soul and body! It is really simple to make. Perfect for a chilly night.